I have scores of watches, so I need a storage solution that can accommodate way more watches than today find, the wonderful Waxed Canvas Watch Roll from the fine folks at Cool Material. But since I usually bring five or six watches on a weekend trip, this is the perfect travel watch solution. 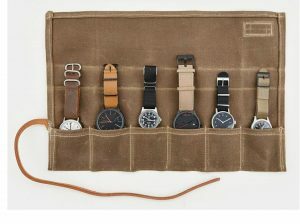 Find the Waxed Canvas Watch Roll from Cool Material here. Find all the “cool” products from Cool Material here. Lost Cowboy is powered by	WordPress 5.0.4 and delivered to you in 1.074 seconds using 40 queries.